and choose from our top selling selection! Pipers Crisps produce great tasing crisps! Crisps with flavours that clearly highlight the provinance of the quality ingredients. From Anglesy Sea Salt to Lye Cross Cheddar, all flavourings are sourced from passionate producers. 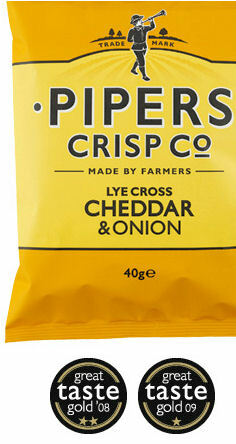 Click here to buy Pipers Crisps! Buy Pipers 150g Bags here! Pipers begin by selecting the very best local potatoes. They then remove just enough skin, slice them to the perfect thickness, then hand cook them in 100% pure sunflower oil until they're the right texture and colour. Pipers use Somerset Cider Brandy Vinegar... Click here to buy Cider Vinegar! To finish Pipers season the warm crisps with the tastiest flavourings, sourced exclusively from people who are as passionate about quality as Pipers.